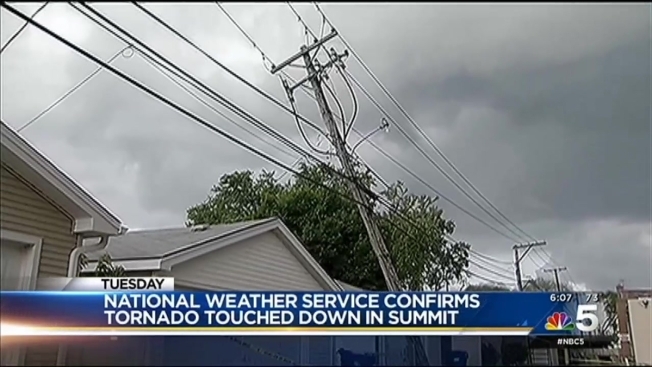 An EF-0 tornado hit Summit, Illinois during storms Tuesday afternoon, officials said. The National Weather Service says the tornado touched down at 1:08 p.m. for one minute.Winds reached up to 75 mph with the tornado path stretching 0.4 miles, according to the NWS. The line of storms Tuesday was brief but powerful enough to cause damage to roofs, bring down tree branches and cause a street lamp pole to tilt. Roberto Galvaz was at work when a neighbor called him to tell him of damage at his home from a downed tree. He came home to find part of his front window shattered. Wind gusts up to 55 MPH damage roofs, bring down branches. NBC Chicago's Regina Waldroup reports. "For a tree branch to fall, and it was a pretty big branch from what I remember, it must have been some really strong wind coming through here," said Galvaz. Another home on the 7300 block of 62nd Place had a portion of the roof blown away. The pieces fell on top of the homeowner's car.